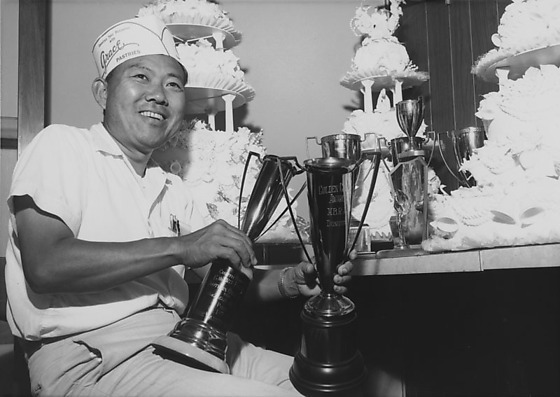 George Izumi of Grace Pastries Shoppe with trophies and cakes in Los Angeles, California, October 30, 1963. Izumi white short sleeved shirt, pants and hat, "Sweeten your occasion with Grace Pastries." Includes Izumi posing with trophy cups in front of white tiered cakes; opening door to trophy case filled with three shelves of trophies behind decorated cakes; and holding a decorated Christmas cake in front of shelves of cakes. Typed on original envelope: Grace Pastries Shop -- Shot of George Izumi with Trophies.